‘Merge your mind into your heart and everything will feel like it belongs to you’. There is nothing wrong with having a mind, indeed the mind is a most sophisticated and useful tool. But if we start to live in it, if we take up permanent residence in our heads, then we are going to experience some frustrating limitations in our lives. This is because our intellect is limited in its functionality. It is designed to dissect, divide and analyse life but it is not designed as a faculty through which to love life and feel connected to all those around us. Its not that the intellect is deficient, it’s just not its job that’s all. To feel life, to love life, to feel connected to everything and feel a part of it all we need a different instrument altogether; we need the heart. 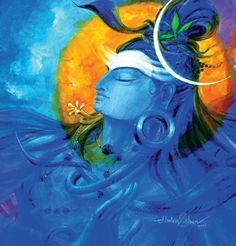 Shiva says LIVE in your heart and USE your mind. In everyday life whenever you find yourself stuck in the head, take a pause, relax your analysis and feel yourself energetically make the ‘one foot drop’ into your heart. Do it whenever you remember and over time you will find you have made a new and lasting home in your heart. As you practice this more and more you will find that looking out from your heart rather than from your intellect gives you a whole new relationship with the world. Everything will start to feel more like it is a part of you and everything in a strange way belongs to you. This union between your heart and your mind, will change your life forever!